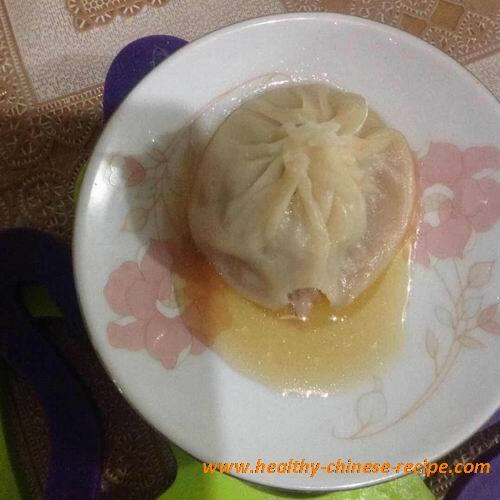 This Soup Dumpling Recipe is traditional Shanghai style. If you feel complicated you may come to learn. The wrapper should be thin and soft. The fillings should be fine and solved in the mouth. The soup inside is made of pure pigskin, not oil, fat, or meat. 1. Wash pigskin, remove dirty part. 2. Boil for about 15mins. Remove fat after cool. 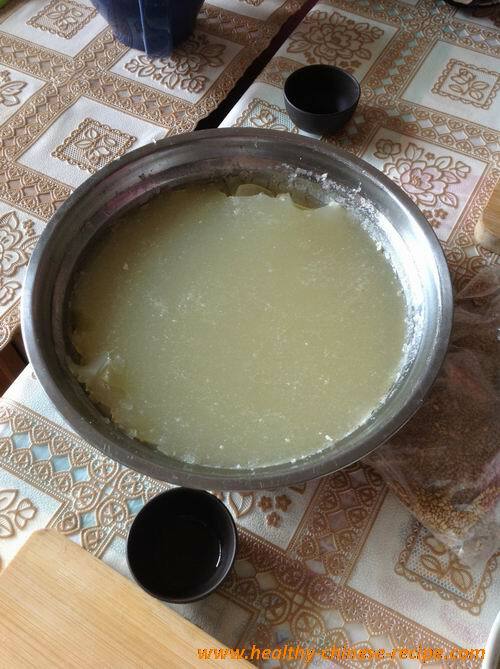 3.Place cleaned pigskin, aniseeds, Chinese prickly ash, rice wine, salt in the pot. Cook for 2:30-3 hours(or one hours in a pressure cooker) in low heat. 4. Remove all ingredients. Pour the soup in a big bowl or basin. Let it solidified in room temperature (around 15 degree centigrade). Then put in a fridge. 1. Boil the Seasoning (chinese onion, ginger, garlic) in a pot(or wok), cool. 2. Ground sesame seeds into powder by a rolling pin. 3. Chop ground pork till very fine and sticky. 4. Add in Seasoning soup, sesame seeds powder, rice wine and salt. Sprinkle sesame oil. Mix well. 6. Store in fridge for at least 15mins. 1. Mix wheat flour and water, add a pinch of salt, knead into dough. 2. Let dough rest 15mins. Knead 5-10mins. 3. Repeat step 2 one more time. 1. You may let the dough rest for 1-2 hours. 2. You may divide the powder into two parts: one is mixed with warm water, the rest is mixed with cold water. After rest, mix them together. 1. Take a dough about 56g(less than 64g, can make 8 small dough, each 7g), knead into long strip. Cut into 7 same size small dough. ( for a beginner you also can make each at 9-10g). 2. Press a small dough in a palm(press on the trace direction). According to “press, backward, and move” three steps to roll a wrapper. 3. Repeat all the rest pieces of small dough. 4. Put a wrapper in a palm. Add about 1 teaspoon fillings, press and firm. Hold it in the right hand; the thumb and finger of the left hand knead and make wrinkles, moving to the right direction(clocksize); The thumb and finger of right hand push forward to the left side(anti-clocksize). Seal at last. Note: For a learner you may add less fillings. 5. After wrapping about 15 soup dumplings. You can cook. 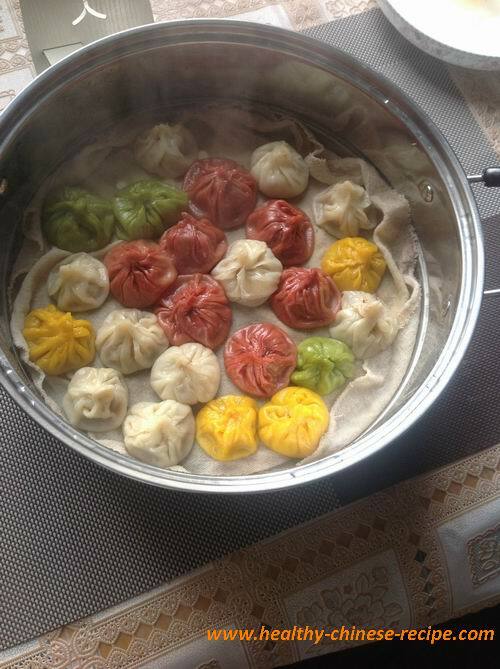 Arrange raw dumpling on a tray of a steamer. Steam for 8-9mins. Stay for 2mins. Serve. Carefully take in a plate. Bite a little, let the soup out. Drink soup, then eat the rest dumpling. You may serve with rice vinegar.